It’s all about the ease. But it needs to be tasty. And warm. And rich. And satiating. 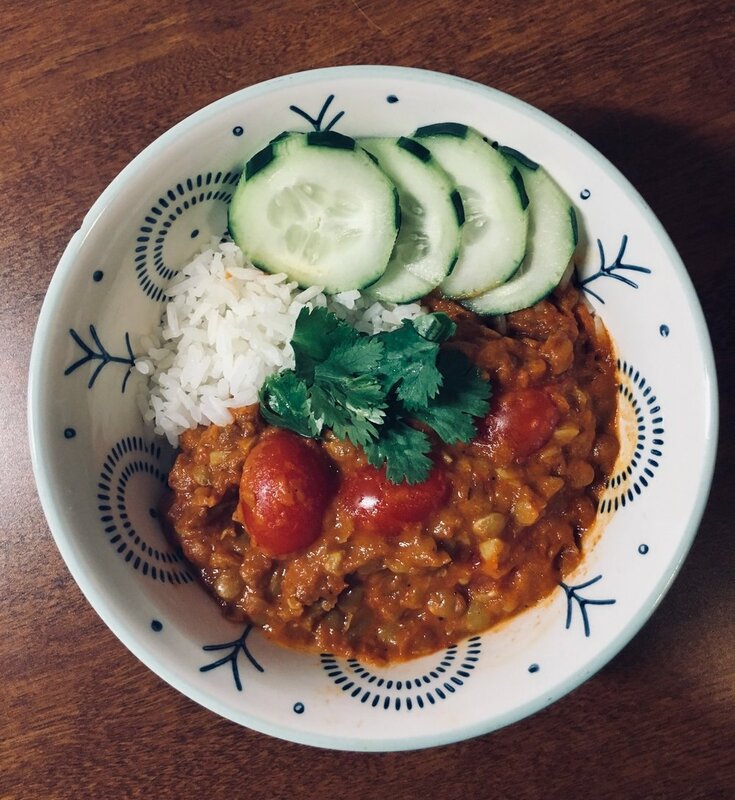 When Eric M. Heath-- for once--delivered the not so upsetting news that classes were cancelled on Wednesday because Chicago was set to become a frozen, frigid land, all I craved was a bowl of warm, rich curry. That was when I thought of this recipe and decided I had to make it and share it with you folks out there. This bowl of creamy coconut lentil curry is everything you can ask for in a one pot recipe. It does take a little longer to prepare , but hey, on the bright side, you won’t need to stand at the stove in wooly socks and 5 layers of garments stirring the pot. It's really a chop, dump, and simmer recipe, as I like to call it. I served it with cooked basmati rice and a fresh helping of sliced cucumber. Sometimes, I also like adding a bit of hot sauce which adds little tang and heat. Even if you are a meat lover, trust me on this one. This dish is really, incredibly, absolutely delicious. Heat up coconut oil on medium-high heat. Add the cumin and coriander powder and stir them around in the pot until its fragrant and starts to brown a little. Add the chopped garlic and stir till it browns. Add the crushed tomatoes, ginger, turmeric, and salt to the pot and cook, stirring the pot a few times, for 5 minutes. Once the water in the curry is quite dried up and the mixture is starting to resemble curry (mixture should be thick), add the coconut milk and cherry tomatoes and bring the pot up to a boil again. Let it boil for 2 minutes before finally, taking it off the heat. * If the curry starts to stick to the bottom, stir the pot once in a while. If the curry looks dry, stir in an extra cup of water. If it's too watery, let it simmer for an extra 10-15 minutes. This recipe should make about 6 servings. It will last in the refrigerator for about 4-5 days. If you’re only cooking for one, you can freeze the curry and it should last in the freezer for up to 3 weeks.